Regular washing has benefits beyond keeping your car looking good. Keeping things clean maintains the paint finish, delays corrosion, and stops you from getting dirty hands every time you open the doors or liftgate. But have you ever stopped to think about who invented the ever-present car wash? Ever since the first car arrived, car owners have wanted to keep their rides looking good. And with roads little more than muddy trails back then this was probably quite a challenge. Naturally enough, entrepreneurs spotted an opportunity, and so the car wash industry was born. The first Model T’s rolled off the line in 1908, bringing affordable automotive transportation to the masses. As the numbers of cars grew, so too did demand for washing services to rid them of mud and dirt. 1914 saw the opening of the “Automobile Laundry” in Detroit, which is usually considered the first car wash in history. The Laundry used an assembly line concept, with cars being driven or rolled through a series of stations. There was no automation though. Instead, workers carried out separate steps of the cleaning process, including driving the cars through for their owners. The next recorded innovation didn’t appear until 1940. This was an “automated” car wash in Hollywood, California. “Automated” was actually a bit of a stretch—cars moved through the stations pulled by a winch system. The actual washing process was still manual. Six years later the automated sprinkler system emerged. This provided the initial rinse function, although the hard work was still left to people. It wasn’t until 1951 that machinery finally took over the entire wash process. Initially, car owners who wanted to take advantage of automated soap dispensing, brushing and drying had to travel to Seattle, Washington. But soon the technology soon spread all over North America. Over time, different variations on the typical car wash service emerged. Now we have the ubiquitous exterior wash, which is probably what most of us use, but there’s also a range of detailing services. Today many car washes are highly automated—including even the payment transaction—but people haven’t completely vanished from the process. You’ll still sometimes see workers guiding customers onto the conveyor and providing an initial high-pressure rinse. 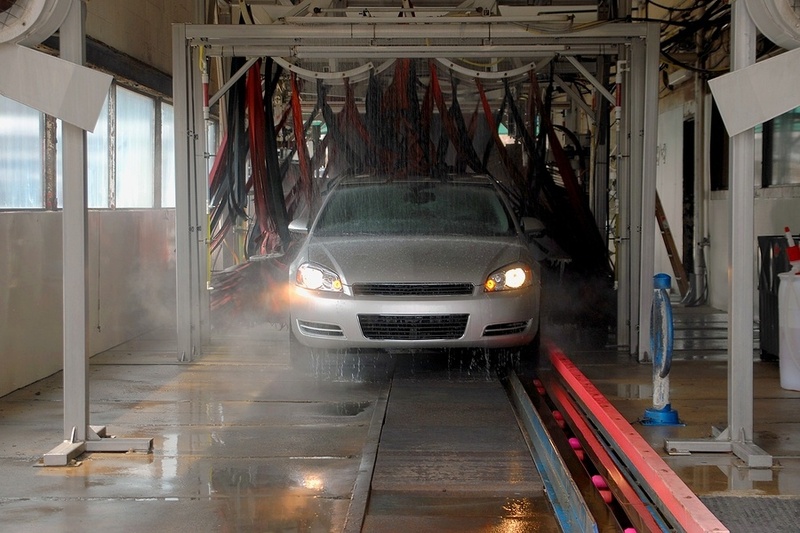 In recent years, two factors have impacted the car wash industry. Second, there’s growing concern over the environmental impact of automated car washing. After all, the process uses a LOT of water and chemicals. Fortunately, however, automated car washes recirculate the water they use, putting it through a filter that removes all the dirt. But what happens when you wash your car at home? That water, detergent, and dirt go into the sewer. That’s why many cities place restrictions on driveway car washing. So what’s a purist to do? Here’s the problem some car owners face: an automated wash just can’t achieve the results you get with a thorough hand wash. So what do you do if you do want to wash your car by hand, yet be environmentally responsible? Here’s how to hand-wash your car the “green” way. First, park on a gravel driveway, your lawn or some other surface that will let the water soak into the ground, rather than run off into the sewer. 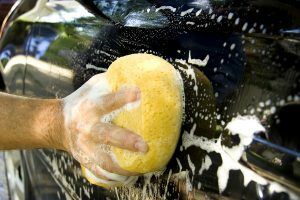 Second, minimize the amount of car wash soap or detergent you use. A bucket full of foam might look fun, but it’s more soap than you need. The first roads left early cars covered in mud, and so an industry was born. These early car washes have evolved into sophisticated machines that do a good job of cleaning off the dirt and leaving our cars shining. For best results though, we at Budds’ feel it’s hard to beat a bucket and sponge. Just be sure to use them in an environmentally-friendly manner!